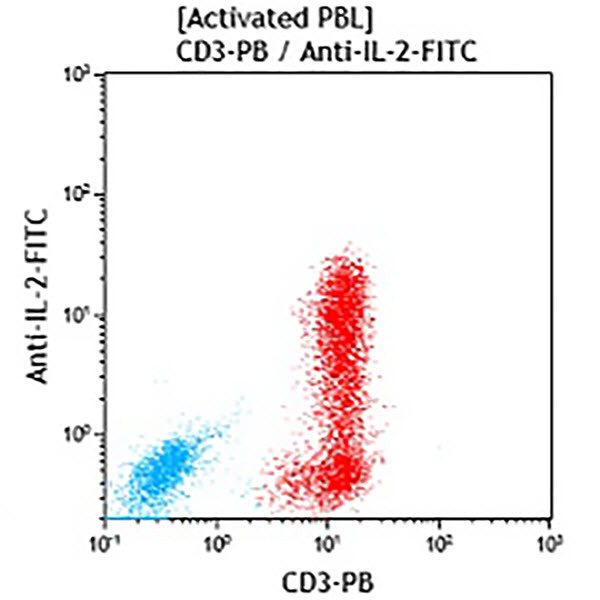 Interleukin-2 (IL-2) is a 15-17 kDa cytokine produced and secreted by T cells. The induction of IL-2 secretion is the first step in T cell activation. IL-2 is the major autocrine growth factor for activated T cells and is obligatory for the generation of cytotoxic T cells. IL-2 also promotes the proliferation and the differentiation of NK precursors, B cells and monocytes. Activated CD4+ T cells of the Th1 phenotype produce predominantly IL-2 and Interferon-γ, whereas CD4+ T cells of the Th2 phenotype produce IL-4 and IL-10.